Mass shootings involving guns have become a fact of American culture. While mass murders happened throughout recorded history, changing civilian gun technology has made the murders more deadly. In 1966 the deadliest mass murder in U.S. history up to that point took place at the University of Texas at Austin. The “Texas Tower Sniper”* killed 16 people and wounded 31 over 96 minutes, using a bolt action rifle and semiautomatic weapons. His weapons allowed him to achieve a casualty rate of one every two minutes. The current deadliest mass murder in the United States took place in Las Vegas, Nevada in 2017. Firing from a hotel into a country music festival, a shooter killed 58 people and wounded 546 over 10 minutes. By using assault rifles converted into automatic weapons, he achieved a casualty rate of one per second. However, most gun deaths are not mass shootings. For example, in 2015 gun suicides killed 22,000 Americans, homicides killed 13,000 people, and mass shootings killed 46. Museums have played a role in the romanticizing of guns, which began with the earliest display of guns in European “Cabinets of Curiosity.” For example, the 17th century Ashmolean collection in Oxford contained numerous firearms, including a musket of the Elizabethan period inlaid with mother-of-pearl and engraved with the heads of Roman emperors. The British Leverian collection in Westminster had early 18th century Turkish guns, and Napoleon III had a Prussian needle gun in his Cabinet of Curiosities. In the late 1800s, Augustus Henry Lane Fox Pitt-Rivers, founder of Oxford’s Pitt Rivers Museum, assembled a large collection meant to trace the evolution of firearms. In the 19th century as museums collected the spoils of colonization, the collection and display of guns and others weapons increased. Military museums, built around armaments amassed for citizen militias and the national military, began housing and displaying enormous collections of guns. American museums, particularly those that portrayed Western expansion, created exhibitions that glamorized firearms, with persistent themes including the “Kentucky” or “Pennsylvania” Rifle (long rifles), Colt revolvers, and armed outlaws who carried these firearms. 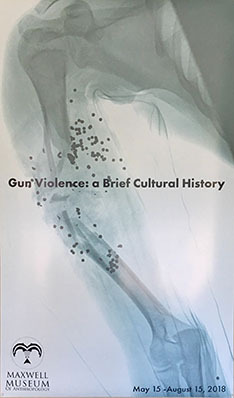 Such exhibitions celebrated a gun-slinging American frontier, based in part on historical events, in part on popular legends, and, in part on outright fiction. Museums have not been the only ones romanticizing guns, but their role in this process is undeniable.